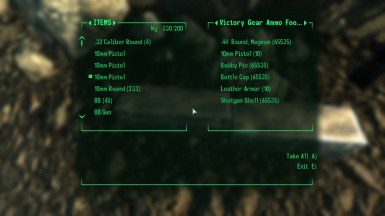 Become the badass gunslinger of the wasteland with the second installment of my "Victory Gear" series of mods for Fallout 3. Do What Thou Wilt With This Mod. Become the badass gunslinger of the wasteland with the second installment of my"Victory Gear" series of mods for Fallout 3. 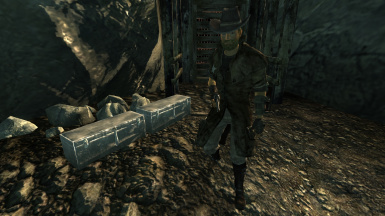 Mod includes an OP set of Sheriff's Armor and Hat, an OP Combat Knife, an OP Double-Barrel Shotgun, an OP Paulson's Revolver, and an OP Lincoln's Repeater. All guns include an invisible scope mechanism activated by aiming with various zoom level magnifications appropriate to the type of weapon. 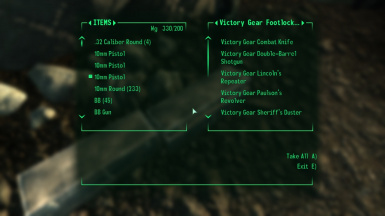 Mod also includes a respawning footlocker with a slew of caps, lockpicks, ammo for the guns, and materials to repair all the items in this mod when they become degraded. Armor includes custom stealth field effect activated upon sneaking, increased carryweight, waterbreathing, and bonuses to various skills. Use mod manager of choice, or unzip file and copy/paste "Data" file into your game's directory. If installing manually, be sure to activate .esp in the game's launcher.